Range light is not so bright. Good design, easy to read bold white colour panel on the black background. Its lightweight (as compared to GE) microwave that Cooks fast and evenly. It's not a high-end microwave oven but smart in design and good in overall performance. It's very popular, large capacity and affordable oven. Sleek design, grey colour with wide view exterior design gives it an attractive look. 4 digit green display is easy to read and clear. Smooth touchpad makes sure that you can use it with just a slight touch. LG LMV2031ST gives you the optimal performance because of its cooking sensor, as it senses humidity level and adjusts the cooking time according to it. Auto and rapid defrost makes life easier for the busy people. It has a preprogrammed popcorn button for making popcorns. It's a powerful beast but works silently without making any noise. You can use this function as a kitchen timer. Simply press the “TIMER” button and enter the desired time at touchpad e.g. 5 minutes. Press “START” and your microwave will beep after the 5 minutes. It will remind you. This feature enables you to quickly start cooking without even touching the Start/Enter Button. Just press the EZ-ON button and it starts cooking with full power for 30 seconds. You can toggle the “EZ-On” button to extend the remaining cook time by 30 seconds. Great for quick reheat food. For the best results always position the dish in the center of the turntable. It's best to cover your food with a microwave safe dish lid when cooking to reduce any food splatter or mess. Avoid using metal dishes or plates, it will damage your microwave. By default LG over the range microwave oven automatically defaults to the power level of 100%. But you can adjust your power level in increments of 10 according to your cooking needs. Just follow the below steps. Some recipes need different power levels during different stages of cook cycle. 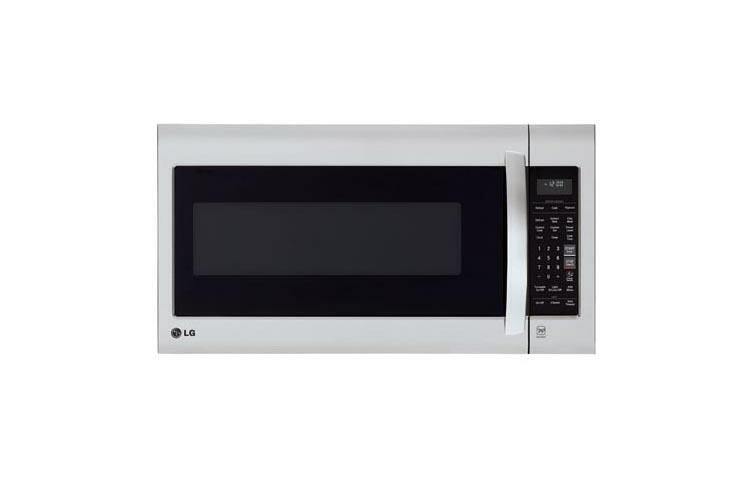 LG LMV2031ST can be programmed up to 2 or 3 stages. For example, maybe at first stage, you need to defrost. You can choose to cook for 4 minutes for 50% power. And then 70% power for 5 minutes and 30 seconds. TIP: Turn Off the turntable if you are using the large dish in the microwave oven.